Not surprisingly, many of the personages involved subscribe to the Theory of the Responsibility of Birds – which is to say that birds consciously and malevolently precipitated the VUE and all its effects. The Falls has been called a “sequel” to Alfred Hitchcock’s The Birds – and in fact the film itself refers to the VUE as a possible “hoax” by Hitchcock himself, who was hoping to “give credence” to the otherwise unsatisfactory ending of his film. This perhaps refers to the closing scenes in which the vivacious and mischievous Tippi Hedren, attacked in a dark upstairs room by a shrieking mob of birds, emerges not only gravely injured but nearly catatonic, metamorphosed into a different creature entirely – oddly and perhaps coincidentally recalling the effects of states of metempsychosis too long sustained by too-intrepid members of the Order of the Third Bird. The Hitchcock film was of course based on a short story by Daphne du Maurier, of the same title. By far the most menacing creatures in that story are the gulls, wheeling in ever-widening circles over unsuspecting farmsteads, riding the swells in massive numbers, like a carpet of white foam, waiting for the signal to attack. The appearance in The Falls not only of references to the Order of the Third Bird but of actual members of the Order is a matter of record. The individual appearing as “Sashio Fallaspy” in the film, whose real name was Sashio Hattori, was a member of a volée of the Order in Swansea, Wales from 1974. Moreover, in the film’s fictional biography she suffers after the VUE from a condition called “après-radiance.” This is an allusion, inserted by Ms. Hattori herself, to the phase known as Radiance in the so-called Protocol of the Representative as practiced by the Order. The story of “Coppice Fallbatteo,” in addition, is a caricature of an associate of the Order (the distinguished Concetto Passerini) with whom the creators of The Falls were somewhat acquainted. 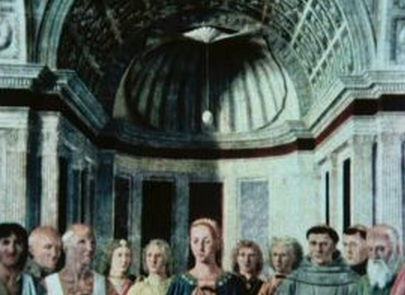 Fallbatteo, in the film, is an art historian “trying to make a novel cultural theory out of the VUE,” embarking upon a “dutiful exploration of the significance of birds in European painting.” His great obsession is Piero della Francesca’s painting known as the Brera Madonna, and the meaning of the egg that hangs so mysteriously from the scallop-shell-shaped apse. Finally, the Greenaway film’s most explicit reference to the Order amounts to a gesture of distancing. Those afflicted by the VUE, it is said, are able to “terminate their relationship with birds” if they manage to be buried in a certain field dominated by a bird-scarer. The saffron color of the bird-scarer in question – recalling the saffron worn by practitioners in the Order – is somewhat heavy-handed, and makes its point sufficiently. However the true purpose of the present communiqué is to request that more research be conducted on a troubling event from the Order’s relatively recent past. It appears that not long after the release of the film – hugely popular among associates of the Order at that time, for reasons apparently unrelated to the Order’s central purpose and calling – a group led, as is so rarely the case, by the Secretary Locotenant of the Order, M. Gylhmat, attempted to conduct a standard Action upon the film, or rather upon a certain segment of it. 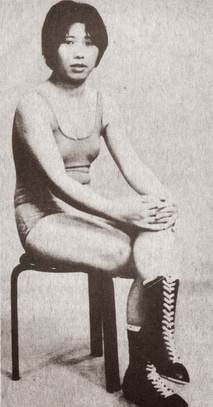 This action took place on September 11, 1982, and the segment concerned was that devoted to the obviously fictional Stachia Fallari and her relationship with the half-brothers Pulat and Ipson Fallari whose name she came to share. 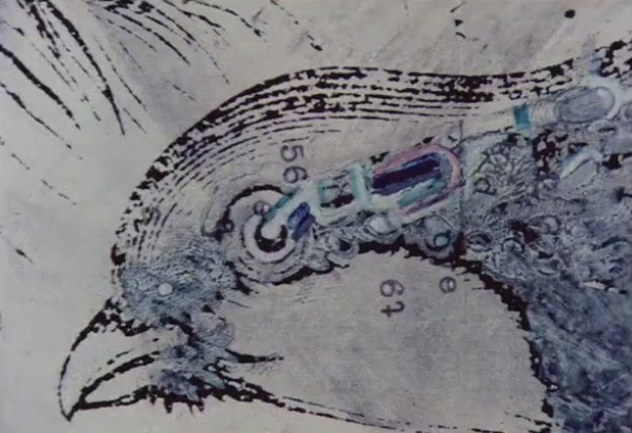 Stachia’s artwork is featured in the segment, including a sequence in which the camera zooms in closer and closer to a pen-and-ink drawing, appearing to reveal finer and finer networks of hatch lines and bird-scratches, as if in deeper strata of inter-imbricated truth and lie. At the time, a number of Protocols for “birding” films – as the birdish colloquialism would have it – were in frequent use, especially in the UK. But this was a highly risky and experimental Action – which explains the (intended perhaps as stabilizing, perhaps further perturbative) presence of the Secretary Locotenant. All participants were aware that the heightened risk of fully attending upon the film was due to the multiple and highly compressed involutions of self-referential fabrication implied by this rendezvous between the Order and the Directory Commission. What remains to us of the event is only that none of the Birds who participated in this Action emerged quite the same; and all without exception changed their names afterward to reflect their changed lives. Moreover, while their new names varied widely, all had originally had last or first names that began with the letters G-U-L-L or could be transliterated that way. The only participant who did not change his/her name was the Secretary Locotenant. However, it seems that M. Gylhmat was the most deeply affected. Gylhmat was not spared, for example, the quadruple partition of the sexes characteristic of the VUE-afflicted in Greenaway’s fictional film – and has been, from the moment the Action ended, a middle-aged female man fluent in the VUE language Betelgeuse. We encourage anyone in our community possessing documentation related to this event which has not yet been fully explored in its implications for the Order (aside from the Secretary, whose reticence is both unassailable and understandable) to kindly come forward.